Background: Inpatient antibiotic stewardship programs often use pre-prescription approval (PPA) or prospective audit and feedback (PAF) to reduce fluoroquinolone prescribing. 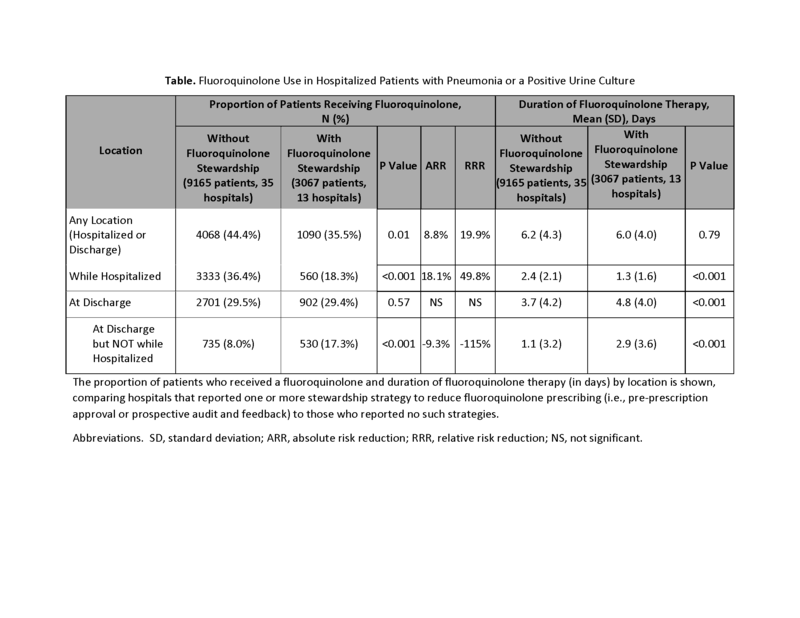 Whether these stewardship strategies targeting inpatient fluoroquinolone use also influence prescribing at discharge is unknown. Therefore, we aimed to evaluate the effect of fluoroquinolone stewardship on discharge fluoroquinolone use in patients with pneumonia or a positive urine culture. Methods: From 12/15-9/17, we conducted a retrospective, cohort study of adult, non-intensive care, medicine patients hospitalized with pneumonia (discharge diagnosis and antibiotics by day 2) or a positive urine culture in 48 hospitals in the Michigan Hospital Medicine Safety consortium. Patients who were pregnant, or had concomitant infections, severe immune compromise, hospital-acquired pneumonia, or ventilator-associated pneumonia were excluded. Antibiotic prescription data were collected via medical record and order review; fluoroquinolone-directed stewardship strategies (i.e., PAF, PPA) were assessed via survey of stewardship leaders. Proportions of patients prescribed a fluoroquinolone (levofloxacin, ciprofloxacin, moxifloxacin) while hospitalized or at discharge were compared, using chi-squared tests, for hospitals with and without fluoroquinolone stewardship. Results: 12,232 patients (7177-pneumonia; 5055-positive urine culture) were included. 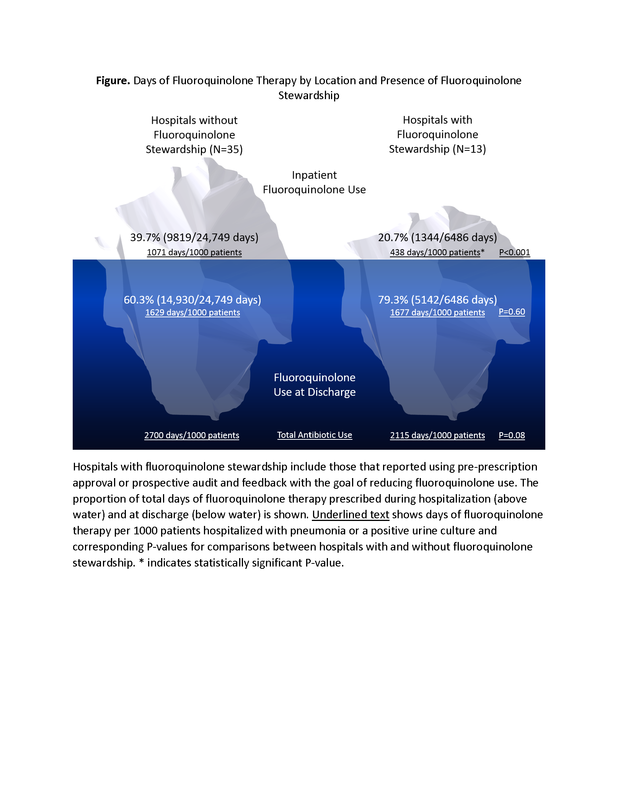 27.1% (13/48) of hospitals reported fluoroquinolone stewardship, which was associated with fewer patients receiving a fluoroquinolone while hospitalized (18.3% with vs. 36.4% without stewardship, P<0.001) and overall (35.6% vs. 44.4%, p=0.01), but not at discharge (29.4% vs. 29.5%, P=0.57). Rather, hospitals with fluoroquinolone stewardship had twice as many new fluoroquinolone starts at discharge (17.3% vs. 8.0% without stewardship, P<0.001). Although inpatient fluoroquinolone duration was less in hospitals with fluoroquinolone stewardship (Table), total fluoroquinolone days (per 1000 patients) were similar to hospitals without stewardship, driven by longer duration at discharge. Overall, 64.3% of fluoroquinolone-days occurred after discharge (Figure). Results were similar when patients with pneumonia or a positive urine culture were analyzed separately. Conclusions: Stewardship activities targeting fluoroquinolone use were associated with less inpatient, but not discharge, fluoroquinolone prescribing. Hospitals with fluoroquinolone stewardship had more new fluoroquinolone starts and longer fluoroquinolone durations at discharge—limiting the overall effect of fluoroquinolone stewardship. By failing to address antibiotic prescribing at discharge, inpatient stewardship may be focused on just the tip of the iceberg. Vaughn, VM; Flanders, S; Chopra, V; Conlon, A; Malani, A; Thyagarajan, R; Gandhi, T. THE TIP OF THE ICEBERG, ANTIBIOTIC STEWARDSHIP AND FLUOROQUINOLONE USE AT HOSPITAL DISCHARGE: A MULTI-HOSPITAL COHORT STUDY. Abstract published at Hospital Medicine 2018; April 8-11; Orlando, Fla. Abstract Top 15 Research & Innovations. https://www.shmabstracts.com/abstract/the-tip-of-the-iceberg-antibiotic-stewardship-and-fluoroquinolone-use-at-hospital-discharge-a-multi-hospital-cohort-study/. Accessed April 22, 2019.